Our Visible Transparency Project (VTP) is back this Friday, Saturday and Sunday with Material Domestication artist Christine Lee. Traditionally VTP has always taken place prior to our exhibition openings, but we are thrilled to have a special opportunity to provide further insight into the creative process with Lee’s artwork, Intersection. 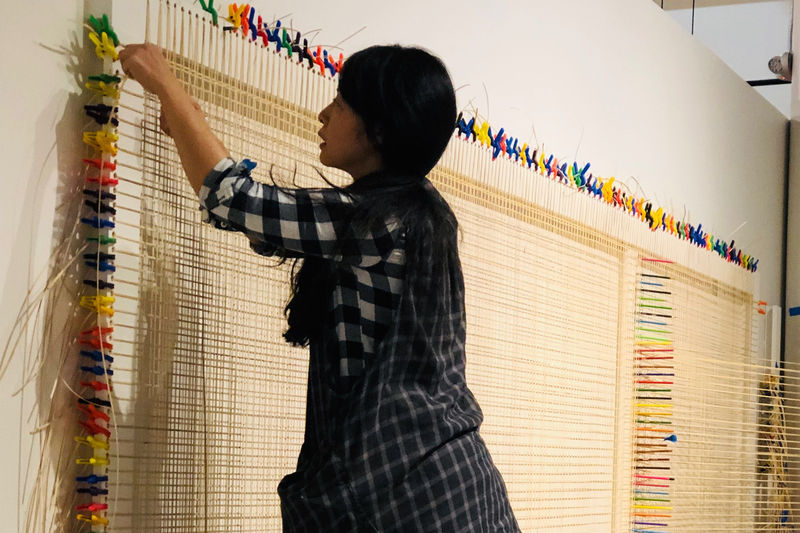 Visitors can not only talk with Lee and watch as she continues her methodical weaving, but she is inviting the public to get involved and be a part of the process. Stop by MCD March 29-31 and participate in the expanded Visible Transparency Project around Christine Lee’s work. When visiting a museum, generally the public enjoys the exhibitions, maybe purchases something from the museum store and returns home. Little thought is given to how the artworks got there or the planning involved in displaying them. Each exhibition a museum stages is a huge undertaking and requires careful design, planning and the collaboration of a dedicated team, especially during the installation process. MCD launched the Visible Transparency Project to provide a behind-the-scenes view into exhibition installation and design and offers visitors the opportunity to watch as this creative process unfolds within the museum’s galleries. MCD is committed to making the museum-going experience more accessible to all.